I loved the Fortress for it’s contemporary style and feel and it has a fantastic bar…check out the hanging seats! A fusion of Dutch and Portuguese styles, The Fortress is stylish, luxurious and right on the beach, close to the fortified city of Galle. The extensive courtyard is the focal point of the resort, the design of which echoes the style of Galle. An impressive property. 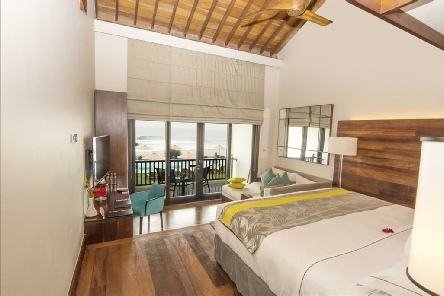 Beachfront, close enough to Galle for shopping and dining out. 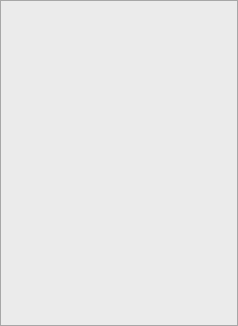 Around 2½ hours from the airport. Rooms are spacious and modern and some even come with a private plunge pool. Fortress Rooms have an enclosed terrace or balcony. If you’re looking for amazing views, opt for an Ocean Room or a Beach Room. Beach Rooms are on the ground floor with direct access to the pool and beach area. The Beach Splash Rooms are located on the ground floor and feature an indoor plunge pool which overlooks the resort’s gardens and beach. Facilities include a pool and an impressive spa in the courtyard of the hotel. 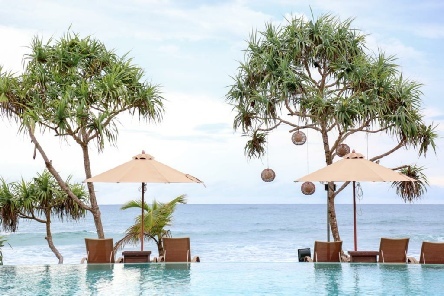 There are two restaurants to choose from – one specialising in innovative Sri Lankan cuisine, and the other where you can enjoy informal al fresco dining overlooking the beach. For a special occasion, Duo is a romantic fine dining venue which has walls that are lined with floor-to-ceiling wine racks. There are also two lounges, one serving a variety of local teas and the other serving cocktails, including some that are infused with tea. 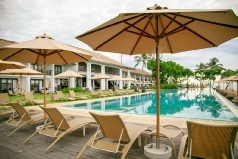 2019 package holidays to the Fortress Resort & Spa Sri Lanka Prices are per person based on two sharing.